A recap of my trip to the most beautiful place on the planet, Greece. One night last semester I was laying in bed, watching the snow slowly pile up outside my window. Classes were already canceled for the next day and everything was grey. In attempts to escape the confines of my dorm room I felt like a prisoner in because of the storm, I imagined myself somewhere warm, somewhere free. And then, I made it happen. 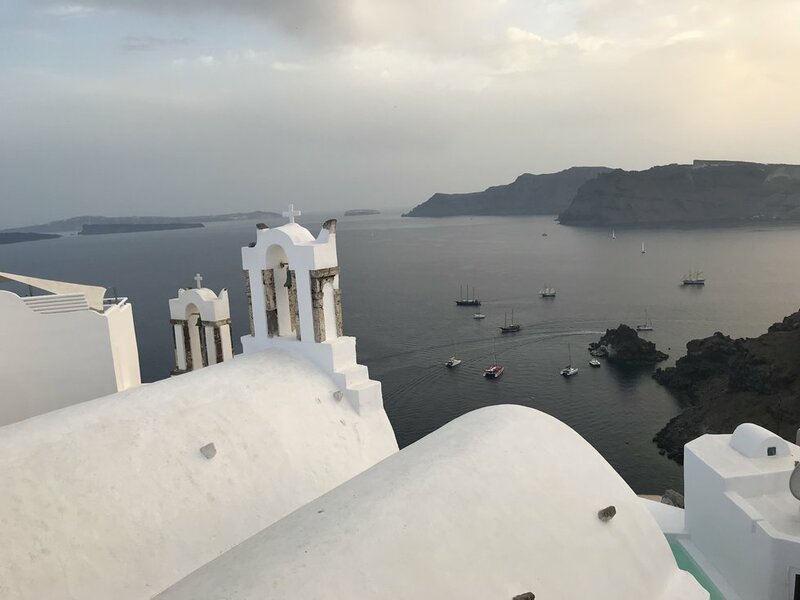 I cannot give the credit to myself entirely; my boyfriend's family living in Greece greatly helped the budgeting and realistically of the trip. But, after one night, I was determined to travel to the other side of the world. That was the very end of March. About two months later, in the very beginning of June, my boyfriend and I were climbing the slippery steps of the Acropolis and sipping cocktails on beaches in Santorini and Andros. Greece, deservingly so, is a destination on many adventurers bucket lists. it has everything you could imagine, a remarkably rich history, breathtaking views that almost seemed too beautiful to be able to exist, wild nightlife, hiking, theatre, and about anything else you could think of. 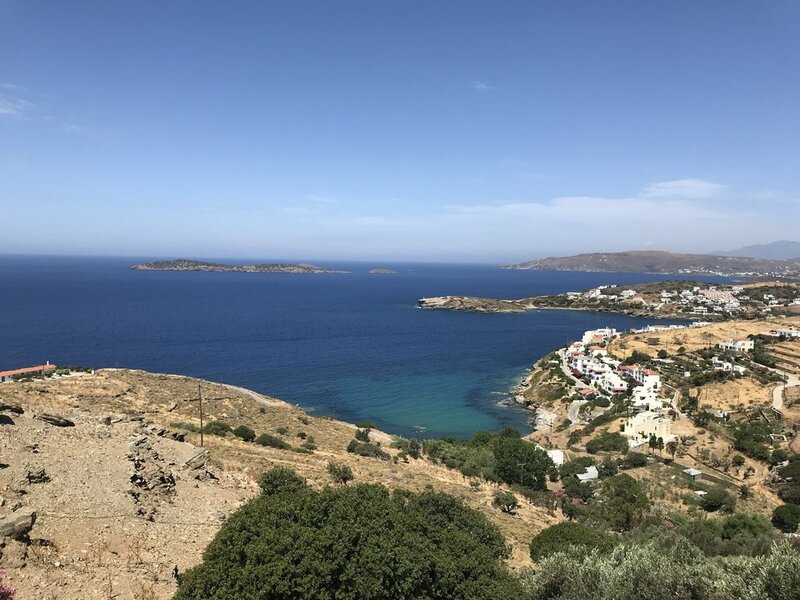 Our trip was perfect in the fact that we saw the historic sectors, the touristy areas, and then dove into the authentic Greek island life, learning mass amounts about the culture and people of this oasis. First, we arrived in Athens. To make things cheaper we stayed in a hostel. Do not let the stereotypes and horror stories turn you away. If you do your research and go through websites like hostelworld.com, you will likely find an affordable yet lovely place to stay. Many even offer private rooms! In Athens, we walked all throughout the ancient city. Modern architecture is scattered around ruins from BC times. It truly is a place like no other. Obviously, we saw the Acropolis and ate enough Greek salad for a lifetime. Next, we took a ferry to Santorini. We were not the most organized and were honestly slightly just winging it, so we ended up having to wait a couple hours for the next ferry to take us to the tourist-packed but beyond the real island of Santorini. When you Google pictures of Greece, the blue domed churches are likely some of the first images to appear. The three domes are in Oia, the tip of Santorini. Here, we rented an ATV and drove all around the island. We relaxed on black sand beaches and met people from all over the world in nightclubs. There were wine tours and opportunities to do anything you could dream all the while overlooking the bluest water you could imagine. Lastly, we took another ferry to Andros. Less touristy but just as, if not more beautiful, Andros is a fishing island. My boyfriends family lives in a little port area called Batsi. The beach is the center of the town and all the shops and restaurants border the crystal clear, strikingly blue water. It was here that I really was engulfed in Greek culture. Every meal was eaten as a family and began with "Yamas!" or "Cheers!" Hugs and kisses were as common as handshakes and high-fives. In Andros, and Greek culture in general, things moved slower and time with friends and family was the paramount institution. We swam for hours and visited other villages around the island. Everywhere you went, a theme of love and genuine happiness was ubiquitous. The natives just wanted you to love their stunning home as much as they did. All in all, my trip to Greece was more than I could have ever imagined. It allowed me to grow as a person and deepened my independence. It granted me more sights of beauty and wonder that I thought possible for this world and opened my perspective to just how small we really are. Make your opportunity to travel. It is possible and it is beyond worth it.